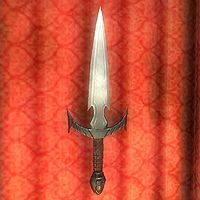 In the Second Era, an Argonian named Trouble-Finder reported coming across a cheap dagger for sale in Ebonheart. It is unknown whether this was actually the Razor, but several cultists believed it was and chased him down for it. Circa 2E 582, Mehrunes' Razor had been shattered into several shards. It was also seen at that time in the possession of a Bosmer woman named Gilraen, a native of Whisper Grove. The city was sacked by a servant of Dagon, Razor Master Erthas, who opened an Oblivion Gate within the city. Seeking to protect her family, Gilraen entered the Deadlands and made a pact with Dagon; she would remain in the realm as a Razor Master, and Whisper Grove would be protected from the Daedra in return. This pact allowed Gilraen to survive indefinitely in the Deadlands, where she visited her wrath upon the region known as the Knives of Discord. However, her husband Fingaenion reopened the Oblivion Gate in a failed attempt to find and rescue her. In doing so and subsequently being menaced by Daedra, he unknowingly broke the pact. After taking the Sigil Stone and sealing the Gate permanently, Gilraen was free to return home to Tamriel, still in possession of Mehrunes' Razor. For game-specific information, see the Daggerfall, Morrowind, Oblivion, and Skyrim articles. This page was last modified on 24 March 2019, at 18:56.